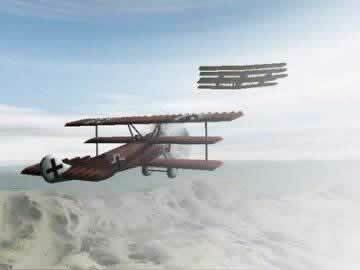 WWI Aces of the Sky Game Review - Download and Play Free Version! Put Yourself to the Test in the First Air Battles Ever Fought! Basic controls do not require the use of the mouse. Flying with only the keyboard can be difficult to maneuver and engage targets. Flying is not realistic and lacks responsiveness. Can't get to the menu once you've selected a mission. Are You Good Enough to Be the Next Red Baron? In World War I: Aces of the Sky, experience the intensity of aerial dogfighting in its oldest and purest form! The Great War was the first major conflict to include air combat, and now you can get in on the intensity! Choose between fighter and bomber versions of the venerable triplane design made famous by the Red Baron. You can always land at your base in the middle of a mission to refuel, reload machine guns or bombs, repair your plane, or even change planes! Never flown an airplane before? World War I: Aces of the Sky has plenty of training missions just for you. When you're ready for the real thing, there are 30 single-player missions in a campaign-style format for you to work through. They give you a huge variety of combat objectives and environments! You're a one-plane air force! Easily keep track of your plane's important statistics - altitude, airspeed, and health indicators. Your radar clearly plots the locations of other planes, ships, and ground installations, both friendly and hostile. Flight controls are intuitive and extremely easy to learn, ensuring that anyone can get right into World War I: Aces of the Sky! Let us take you back to a time when air combat truly tested the mettle of one man against another! Do you have the courage and skill to do what must be done? Fire up your engine and find out and download World War I: Aces of the Sky. "Cleared for takeoff . . . chocks away!" Though it's not completely flawed WWI: Ace of the Skies is rather boring and doesn't have the wow factor that would set it apart from the rest of the air combat competition. Yes, flying a plane is somewhat of a novelty, however, that excitement wears off quickly and is not worth too much. The game's monotony, especially when completing objectives takes away from this game drastically, making it just another plane game in an already packed genre. 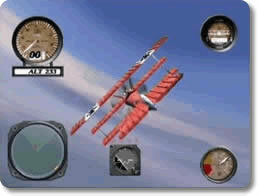 As a pilot you fly like the Red Baron and take down the enemy in your WWI triplane. To do this you can choose between two planes: a red triplane gunner built for high-speed maneuvering or a silver triplane bomber, which is bigger and less mobile, but has bombs that can do a lot of damage. You fly using the arrow keys of the keyboard (or joystick if you have one), and your other commands like acceleration and firing your weapon are also controlled through key commands. Getting started in this game isn't too hard as the controls are pretty simple; however, if you do experience difficulty getting started there are helpful tutorials that explain the basics of the game. Essentially as a dogfighter your job is to gun down enemy bombers, satellites, and other objects tainted by the enemy. The first levels of the game are pretty basic and increase in difficulty as you progress. Your first mission is to take down two bombers and then destroy a cluster of poisoned water towers. Typically the levels are basically the same objectives. For example each of the levels have the same basic idea: take down a few bombers and then a larger object. This will sometimes vary (take down a huge object and then some bombers), but is typically the same. This similarity between the levels causes the game to get old fast. Don't expect to experience any variation after the first 15 minutes of play. Since the objectives and premises don't really change, it is easy to get bored with this game. As far as controls and responsiveness of the planes, this game is just alright. Yes, flying the planes is pretty simple and initially entertaining, however, as you progress flaws begin to pop up at a surprisingly frequent rate. The first flaw you may notice is with the aiming. Aiming is really hard to do, especially with just the keyboard and arrow keys. The keys are very sensitive so it is hard to zone in on your enemy. If the mouse were incorporated into the aiming and shooting part of the game it might make playing more enjoyable and certainly easier. Another flaw of the game is with flying. Your planes are very limited in what they can and cannot do. Even with the sleek red gunner you are not able to barrel roll or execute maneuvers quickly at high speeds. As a result, your attacks tend to be very loopy and drawn out. The third major issue with flying and attacking presents itself when you are taking down bigger carrier fleets. Your machine guns do little to no damage and will cause you to make at least four or five passes on the ship before you can take it down. Considering there are typically eight to ten ships, this becomes extremely tedious and boring. Yes, you can use the bomber to make the job go quicker, however, the dropping bombs is inaccurate, you have a limited supply, and the bomber planes are unable to maneuver quickly. 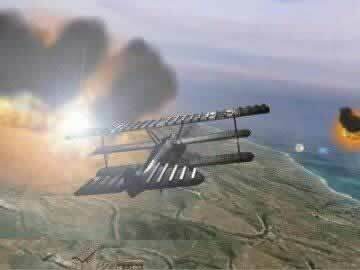 Overall, WWI: Ace of the Skies is an air fighting game that leaves a lot to be desired. Though the game is functionally sound it doesn't do a whole lot right when it comes to excitement and creativity. This game is far from cutting edge and relies too much on the mystique of flying a plane. The relaxed style of play and mild violence make this a game for all ages. This is by no means the best aviation game on the market, however, if you are so inclined to give it a try, check out the trial before running the full version.